The 90th anniversary edition was celebrated with the second fastest winning time in the history of the event. 2010 winner Gilbert Chepkwony started his solo run for home after 30km and missed his personal best only by 10 seconds. Helped by by pacemakers Matthew Kimutai and Albert Matebor, and by the good weather (11.5°C, no wind, cloudy), the leaders passed halfway in 1:04:20. While other sub-2:10 runners faded, only Brighton 2013 winner Dominic Kangor hung on to finish second, two minutes behind Chepkwony. "In 2010 we were three runners together until the end. It was tougher today as I was alone after 30km and felt cold" said Chepkony. Defending champion Patrick Korir finished fifth. Katarina Beresova helped to pace the women's race and in doing so won the half-marathon in new personal best (second fastest ever Slovakian). A trio of African runners followed her through in 1:13:40 but the favorite, Lydia Rutto, pushed ahead of the Ethiopian duo Lemelem Hachem and Halima Beriso after 35km to win comfortably, 26 seconds outside her personal best. She had missed her flight in Nairobi and arrived a day late but said that it did not influence her result. Slovak marathon titles went to Boris Csiba 2:29:03 (11th overall) and title defender Ingrid Petnuchova 2:51:15 (4th overall, her 6th title). Over all races and categories there was a record entry of 10 000 runners from 45 countries. Attending this 90th anniversary celebration of the oldest marathon in Europe were special guests Hansjorge Wirz, European Athletics Association president and AIMS President Paco Borao. A record 40,802 runners crossed the finish line in Grant Park under ideal weather conditions with men's winner Eliud Kipchoge and runners-up Sammy Kitwara and Dickson Chumba all going sub-2:05. Rita Jeptoo easily defended her title, breaking away after 35km to win in a time almost five minutes slower than she ran last year. The men's race opened with a world record chase a pack of 11 went through halfway in 1:02:11. Pre-race favorites Eliud Kipchoge and Kenenisa Bekele (ETH) following the leaders in what grew into a tactical race. Kipchoge, Kitwara and Chumba stayed together until Kipchoge made his final move at 40km. Jeptoo was simply unbeatable in the women's race as she put in a 16:37 5km split from 35-40km to float away from her opposition. Early leader Amy Hastings topped the US field in fifth, matching her personal best. The 15th edition attracted a record number of 6500 runners in the marathon, of whom 6 326 finished. Women's winner Irene Chepkirui Makori set a new event record on a first-timer friendly and interesting new course which included the INEA Stadium — one of the Euro 2012 football venues. 1500 children took part in accompanying races and 20,000 people visited the Poznan Sports Fair Expo. A Volvo V40 Cross Country car went to the winner of the marathon lottery and one runner won a weekend stay at the Stockholm Sheraton — sponsored by the Poznan Sheratonl. More than 44,000 runners registered for the various races of the 39 (marathon, Mizuno Half Marathon, TCS 8 km and Kids Run), with nearly 16,000 registered marathon The 28-year old Kenyan Bernard Kipyego won his first major marathon in a personal best despite the difficult weather. Runners faced a temperature of 18°C, high humidity, direct sun and strong wind between 15-20km. The lead group reached halfway in 63:40. Kipyego was the only one who ran the second half faster(62:40). He broke away in the Vondelpark after 38km. The young Lucas Rotich and John Mwangangi who won the Dam tot Damloop a month before both ran well to set personal bests. Three time winner Wilson Chebet did not finish. 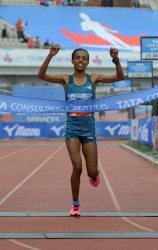 In the women's race winner Betelhem Moges was disappointed with the time, but Meseret Hailu, the course record holder was unable to finish. 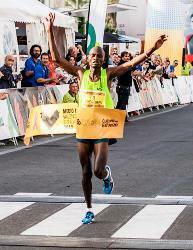 Ethiopia's Girmay Birhanu and Fatuma Sado were winners of the 34th edition writes Mirko Jalava. Birhanu, fastest in the field and race favourite, became the third successive Ethiopian man to win the race. By contrast, Sado was the first overseas women's winner since Great Britain's Debie Noy back in 1991. Birhanu and Degefa broke free and quickly opened up a big gap. They remained together until the last 500m when Birhanu kicked clear. Fatuma Sado grabbed her fourth in 10 marathons. In third, 21-yearold Gong Lihua won the Chinese title in personal best with the world junior best holder (2:22:38 in 2008) Zhang Yingying rather short of that form in fourth. The race has won unwelcome notoriety as many of the estimated 30,000 participants — although none of the elite field " were running with face masks to combat a blanket of smog which had descended. The marathon's organizing committee said late on Saturday that postponing the event would be difficult because of all the planning that had gone into it, and asked competitors to understand, which generally seemed to be the case. The environmental conditions deteriorated on Sunday morning sufficiently for Beijing's environmental centre to issue a warning suggesting children and the elderly to stay indoors. 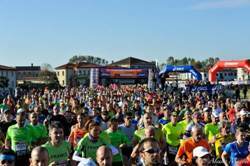 It was unseasonably warm but that did not stop 2,331 participants completing the various race distances (42km – 33km – 21km and 21km+21km Relay) along the shores of Lake Maggiore in the Piedmont Region. The Marathon and 33km start and finish in Verbania Pallanza while the 21K start in Verbania Pallanza and finishes in Stresa. Transportation for all participants is provided free of charge using panoramic ferryboats very much appreciated by everyone. The absence of African elite athletes made for a more unpredictable race, won by an Austrian, Christian Robin. At the end, Christian Robin, who was enthusiastic about the landscape said he would come back &mash; but on holiday. A new record of 26,700 runners participated in all events, 5260 of them in the marathon coming from all Canadian provinces, 42 US states and 50 other countries. An innovative YouTube broadcast was livestreamed all over the world with commentary by Eurosports' Tim Hutchings. The men's field had targeted the course record (Derissa Chimsa's 2:07:05 from last year) and although they remained committed at halfway the cold temperatures and blustery wind eventually forced a slowdown, but one which included some exciting racing. Pacemakers took the leaders through halfway in 1:03:15 but the pace slowed as they turned uphill along the Bayview extension. When they dropped out at 30km Kenya's Peter Some surged ahead with Patrick Terer alongside him. Then, with only 4km to go, Laban Korir and Tariku Jufar came into view and flew past the leaders. 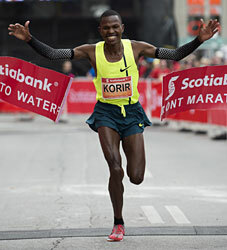 Korir later said that a pain in his calf had slowed him, but in the final kilometre he ran away from Jufar to claim the win: "After 30km I felt something tender in my legs so I decided to set my own pace and that was okay but I was looking back and saw Jufar was behind me. I was worried because I knew he had won some races and I thought he might beat me." Mulu Seboka of Ethiopia, the 2008 Toronto winner, emerged victorious in the women's race in a new personal best time. Although she crossed the line with her usual broad smile she collapsed shortly afterwards and was taken to the medical tent. Through the latter part of the race it was her friend and compatriot Amane Gobena, the 2009 winner, who had offered the biggest challenge but she faded in the last 5km to finish fourth. "The weather was a problem and because of that I didn't make a good time," said Seboka, "But still it was okay. For sure if the weather is better I can get a better time." Canadian women's record holder Lanni Marchant went out very hard aiming to beat the record she set a year ago (2:28:00) but at 27km her calf cramped in the cold conditions. She went on to finish a creditable seventh. The other leading Canadian marathoner, two time Olympian Eric Gillis was on Canadian record pace through the first 25km but also succumbed to the cold, although like Seboka he set a new personal best: "I am 34 and still running my best time, and enjoying it. Feels good," he said afterwards. Abraham Cheroben ran a world leading time and set a Spanish all-comers record, leading three others under the hour. 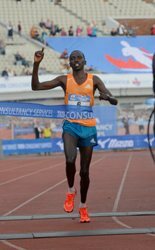 He is the ninth successive Kenyan winner of the race, which has acquired a deserved reputation for fast times thanks to its flat course through the historic city centre and port area. Runner-up Kenneth Kipkemoi also set a personal best. Cheroben and Kipkemoi move up to equal fifth and 13th on the world all-time list. Asked about the possibility of tackling a marathon sometime soon, Cheroben said: "My only goal in the near future is to break the half marathon world best." The leading group went through 5km in 13:57 and the pace even speeded up slightly in the second 5km so that an all-Kenyan quartet of Cheroben, Kipkemoi, Matthew Kisorio, and Titus Mbishei passed 10km in 27:40. Kisorio pushed the pace in the middle stages but Cheroben always looked comfortable and just before 15km he started to pull away, extending his advantage all the way to the line. Two-time world cross-country champion Emily Chebet won the women's race in a course record after going quickly to the front with just Joyce Chepkirui for company. The pair went through 5km together in 15:37 and 10km in 31:40, 10 seconds ahead of the chasing group. Chebet made her move halfway into the the race and by 15km she had a lead of 26 seconds over Chepkirui and Margaret Muriuki, who had caught the flagging Chepkirui. Chebet, Cheroben, then turned in an outstanding final 6km to finish more than a minute in front of Muriuki, while Chepkirui slumped to fourth. More than 10,500 runners finished. Jordan's Olympic marathoner Methqal Abu Draes won the sixth edition held on the four lap City centre course that finishes at the 6000 seater Roman Amphitheatre built in 166AD. Abu Draes sat in the lead group of five in the early stages, but pulled away from countryman Fathi Aldyat with 30km completed. Mohammed Mohammed had been in contention to halfway, but then fell off the pace. Sarah Kebaso was out on her own for the entire race, but ran a consistent pace to set a new course record time. Sudan's Hanoyea Hasballa, in second, only moved up to the marathon distance when flight problems delayed the remainder of the elite field. A half marathon using two laps of the same course was introduced for the first time. Including the mass 10km race over 8500 runners took to the roads to experience the beauty and history of the Jordanian Capital and to raise funds for the run for a cause charity project. For much of the race Aberu Kebede looked set to break the course record (2:21:01 by Meselech Melkamu in 2012). She reached 35km in 1:56:38, after having been on her own from halfway, but she tired over the final 4km to finish over a minute outside the record. It was her third fastest time and her sixth win (of 13 marathons run). Sharon Cherop was together with Kebede and Melkamu (who dropped out at 30km), reached halfway in 1:10:35 but she had no answer when Kebede upped the pace shortly afterwards. Ashetu Bekere trailed by 85 seconds at halfway within a group of four, but came through strongly to slice almost three minutes off her previous best. Last year's Kenya's Mark Kiptoo was outsprinted in the last few hundred metres, but this time turned the tables on his younger rivals. A lead pack of 14 (excluding the pacemakers) went through halfway in 1:02:32 as requested by the race organisers but there was some very uneven running during the first half of the race, with the first 10km covered in a very quick 29:24 but slowing down after 15km (44:13) which carried over into the second half of the race. Twelve runners reached 30km in 1:29:14 but between 30–35km, several dropped back, including last year's winner Vincent Kipruto and the highly-rated Ethiopian junior Tsegaye Mekonnen. Six were still in contention at 35km (1:44:21). By 40km only four remained but Tebalu Zawude lost contact soon after to leave Kigen and Yegon heading the 38-year-old Kiptoo by a few metres. Kiptoo used his track speed (12:54 5000m) to kick past his countrymen as the first six finished within 40 seconds of each other. In ninth Arne Gabius debuted with 2:09:32, the first sub-2:10 time by a German since 1990 and the third fastest by a European this year. Thousands of spectators basked in sunny but still favourable running weather while cheering more than 20,000 runners in the three different events writes Tomo Sarf. In the process they generated a great sporting atmosphere. For the first time the Marathon runners were doing only one lap, which extended the course to cover all the most scenic parts of the city — with the finish in the old city centre. The men's winner, Ishmael Bushendich, equalled the course record and proved the new course just as fast as the old one. With this 19th edition Ljubljana demonstrated that it is fast becoming one of the must-do road races in Europe, and much greater numbers are anticipated for the 20th anniversary event in 2015. A total of 29,921 runners (7248 women) started and 28,092 finished. The 21st edition incorporated the Montenegro national championships for both the marathon and half marathon. Over 541 runners from 35 countries took part along with around 5000 participants in eco-race and eco-marathon. European Athletics Association vice President Jean Gracia and Balkan Federation President Dobromir Karamarinov were guests of honour. Ethiopia claimed a winning double at the 29th edition, but the times were slowed by strong winds writes Diego Sampaolo. The women's winning time was the slowest ever, 17 minutes adrift of the course record. The men also set off at a very restrained pace. Robert Ndiwa, who was pacing to 25km, passed 10km in 31:17. Ketema Mamo closed him down at 15km, pullling away from the chasing group of three. The race then continued at a modest pace: reaching halfway in 1:05:52 and 25km in 1:18:08. Mamo was alone in the lead after 25km and and continued to pull away.The 20-year-old went through 30km in 1:31:50 before crossing the 4km Liberty Bridge, which links Mestre to Venice. The effort took its toll on Mamo in the last section of the course, which is the hardest part of the race. Runners cross 14 bridges in the final 3km before passing through the Piazza San Marco and by the Palazzo Ducale to reach the finish in the Riva dei Sette Martiri. Mamo reached 40km in 2:07:01 but, visibly tired, ran the last 2.2km at four-minute pace — although his victory was never threatened. Former Italian national marathon champion Giovanni Gualdi moved through the field in the closing stages to take second. In the women's race training partners Gedefa Motu Megersa and Konjit Tilahun broke away from the rest of the field early and led through halfway in 1:21:14. Tilahun went ahead at 25km and ran alone for 17km to win by a huge margin of almost 12 minutes. Megersa struggled in the final stages but held on to second place. For the first time Dublin Marathon attracted a field of over 15,000 runners, including more than 4,000 from outside Ireland. In all, 47 countries were represented. The event featured a Viking theme to mark the 1000th anniversary of the Battle of Clontarf (now a suburb of Dublin). The Vikings who had founded the city in the 9th century were defeated there and expelled from Ireland in 1014. But the Scandinavian hordes were back for this 35th edition, with many running in Viking battledress. This time the citizens of Dublin gave them a warm welcome. The course is a single loop, relatively flat, starting and finishing in the city centre. Three waves, 10 minutes apart, ensured a smooth start for all runners. Phoenix Park, Europe's largest urban park, is home to wild deer as well as Dublin Zoo. Runners go right through the middle of it between 5–10km. In near perfect running conditions Eliud Too (Kenya), a surprise late entrant, won a close men's race while Esther Wanjiru ensured a Kenyan double by defeating last year's champion Maria McCambridge by a similarly narrow margin. McCambridge had the consolation of running a personal best at the age of 39. The Lord Mayor's Medal was presented to 83 years young John Collins, who ran his 30th consecutive Dublin Marathon this year. Mark Ennis of SSE Airtricity made a presentation to Tony Mangan, who took the last step of his incredible 50,000km run around the world when he crossed the finish line in Dublin. Another Guinness world record was set when 30 members of the Hughes family from Westport, County Mayo, completed the marathon. In 1980 Dublin hosted the first mass participation marathon in Europe. London followed suit in 1981. The Dublin Marathon was the brainchild of one man, the late Noel Carroll, Irish 800m Olympian and Public Relations Officer of Dublin City Council. 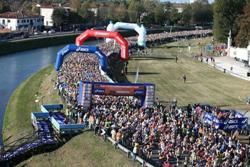 From modest beginnings it has grown to become one of Europe's biggest marathons. The 36th edition will be on 26 October 2015.